Why try and figure it out. No need to understand. Isn’t it meaningless anyway. What and why it matters is all you need to know. Jesus died for me and you, to do what we couldn’t. He rose from the dead, so we could be one with God through His Spirit which is alive within us. His love is perfect and conquers all. 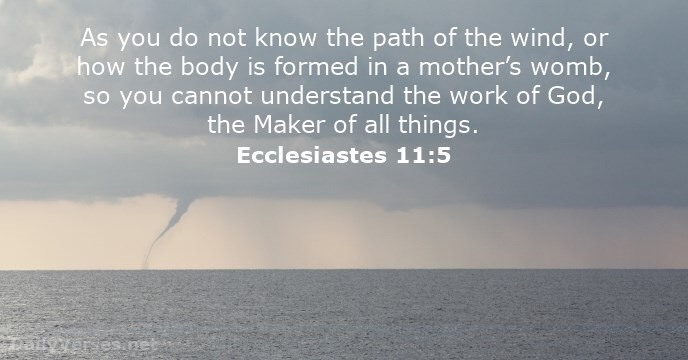 Ecclesiastes 11:5— Yes, “the activity of God” is as difficult to understand as “the path of the wind,” and Jesus tells the Pharisee Nicodemus: “The wind blows wherever it wants. Just as you can hear the wind but can’t tell where it comes from or where it is going, so you can’t explain how people are born of the Spirit”( John 3:8 ). Plant your seed in the morning and keep busy all afternoon, for you don’t know if profit will come from one activity or another-or maybe both. Young people, it’s wonderful to be young! Enjoy every minute of it. Do everything you want to do; take it all in. But remember that you must give an account to God for everything you do. So refuse to worry, and keep your body healthy. But remember that youth, with a whole life before you, is meaningless. This entry was posted on July 3, 2018 at 6:05 am and is filed under One Walk. You can follow any responses to this entry through the RSS 2.0 feed. You can leave a response, or trackback from your own site.